I’m at the age where a lot of my friends have kids. Lots of adorable pictures pop on social media of babies and toddlers. All different sizes. Tall, chunky (my favorite), and tiny. Baby checks always include growth rate metrics like height-age, weight-age, and weight-height to name a few. That data is collected and compared to the national average. Luckily for them stunted growth isn’t a problem. Unfortunately stunted growth is more prevalent in developing countries due to lack of quality nutrition. A research study gave babies 6 to 9 months old, eggs to eat and compared them to a control group (no eggs). 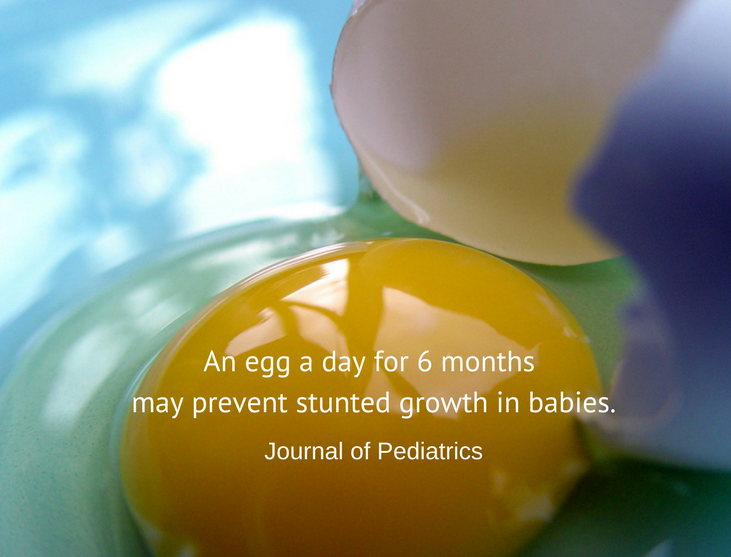 Children given eggs were 47% less likely to have stunted growth. Researchers use eggs due to there abundance and low cost. This study may not have much relevance to people reading this because nutritional resources and support are ample in this country, but I believe this speaks more to the nutritional value of an egg. You’ve read the many differing opinions on eggs. It’ll raise your cholesterol and increase your risk for heart disease etc. As you’ve probably guessed, my opinion is different. Eggs should be a part of your daily routine. They are a cheap source of a nutritionally dense food. One egg contains approximately 75 calories, and is packed with 13 essential vitamins and minerals. Also add 6 grams of protein to boot. Stop using the egg whites only. The yolk has all the important nutrients. Let’s say after reading this article, You’re going to start eating eggs and giving them to your children. First, check to see if your toddler has an egg allergy by mixing the egg and placing a dab on the forearm. After 24 hours check to see if there is a rash. If there is no rash, it’s safe to consume hard boiled eggs . Second, solids should be introduced to babies starting at month 6 of age and beyond. No solids including eggs should be consumed before then.